1. Stephen Lake, b. 13 Feb 1650, Boston, Suffolk Co., Mass. 2. Mary Lake, b. 27 Jul 1653, Boston, Suffolk Co., Mass. 3. Thomas Lake, Baronet, b. 9 Feb 1657, Boston, Suffolk Co., Mass. 4. Mary Lake, b. 1 May 1659, Boston, Suffolk Co., Mass. 5. Edward Lake, b. 28 Jun 1661, Boston, Suffolk Co., Mass. 6. Edward Lake, b. 15 Jul 1662, Boston, Suffolk Co., Mass. 7. ANNE LAKE, b. 12 Oct 1663, Boston, Suffolk Co., Mass. 8. John Lake, b. 22 Feb 1666, Boston, Suffolk Co., Mass. 9. Nathaniel Lake, b. 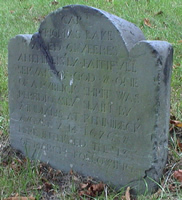 18 Jul 1668, Boston, Suffolk Co., Mass. 10. Rebecca Lake, b. 6 Jul 1670, Boston, Suffolk Co., Mass. 11. Sarah Lake, b. 14 Sep 1671, Boston, Suffolk Co., Mass. Captain in the Ancient and Honorable Artillery Company. On 31 May 1671, his name appeared on a list of the members of the First Church of Boston. The source (, p. 218-19) says he was descended from Hugh de Caley, who died in 1286, and Agnes, daughter of Hamo de Hamstead, citing Bentham�s Baronetage, v. iii, p. 153. [S254] Wells, Charles Chauncey, (Chauncey Park Press (Oak Park, Ill.)), F73.61/B681/1998.